For over 45 years, Nimlok has designed and manufactured creative, top-quality trade show displays, exhibits and environments that enable exhibitors to engage their customers in ways that are truly unique. Nimlok is a premier trade show exhibit solutions company that delivers creative displays tailored to exhibitors’ specific needs all across the world. Nimlok’s exclusive and expert dealer network serves clients with a full spectrum and expansive range of exhibit design and display solutions, graphics and related trade show and event services. 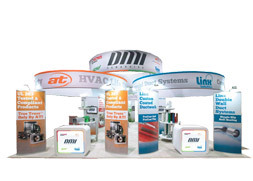 From a small conference to a large convention, Nimlok dealers work to understand client trade show and event needs and then develop a budget and branding program that result in successful events that deliver an excellent return on investment. Visit our project and product portfolios to see the various types of display solutions available through your Nimlok distributor or browse our library of educational resources for exhibitors. From exhibit design, to production, to logistics management to educational training, Nimlok’s network of dealers are true partners for exhibitors and event marketers alike. Nimlok is a division of Orbus Exhibit & Display Group® – a privately owned group of companies that specialize in the manufacture and trade only supply of trade show displays, trade show exhibits, architectural wayfinding signage and fabric exhibit solutions. 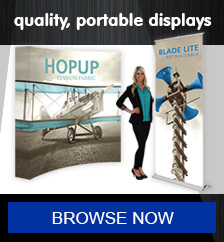 Our Fast Solutions portable trade show display products contain everything you need. 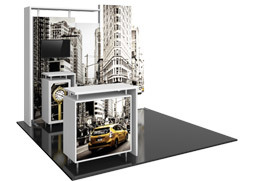 From banner stands and collapsible display products to our modular displays, Nimlok has all the necessary booth supplies and tools for creating the unique trade show booth and face-to-face marketing experience you desire. Browse our portfolio of over 300 quality display products or contact a Nimlok dealer, who can walk you through our different product offerings to help you choose the perfect display solution for your next event. Backed by competitive hardware and graphic warranties, Nimlok Fast Solutions are unmatched in quality while remaining lightweight, portable and user-friendly. 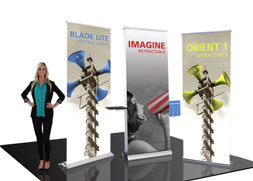 From the office lobby to the trade show floor, Nimlok’s Fast Solutions portable trade show display products will help communicate your branded message to your key audiences in any setting. 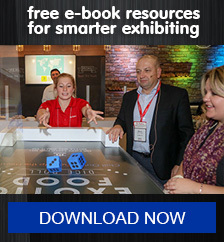 Looking for inspiration for your next exhibit? 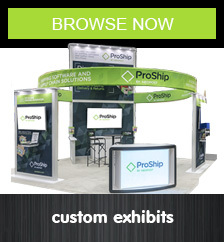 Search our portfolio to browse over 1,000 custom and custom modular trade show exhibits in our custom exhibit search portfolio. From small 10’ x 10’ exhibits to scalable and reconfigurable exhibits to large island exhibits and beyond, Nimlok designs and builds a wide range of innovative custom exhibit solutions. 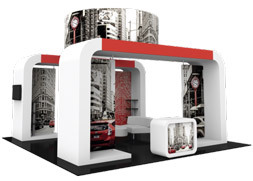 When designing and building a custom or custom modular trade show exhibit, expert Nimlok dealers work one-on-one with clients to understand their exhibiting needs, as well as timeframe and budget. After assessing these important details, exhibit designers concept display solutions to fulfill needs and help exhibitors achieve their goals. Contact an expert Nimlok dealer today to begin the conversation and the journey to building your own customized exhibit solution. 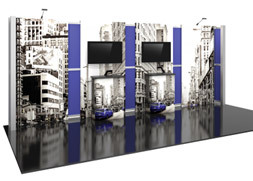 Nimlok makes trade show booth rental quick and painless with off-the-shelf exhibit kits and accessories, as well as large-scale, custom-designed rental exhibits. Nimlok’s popular rental display program is easy. 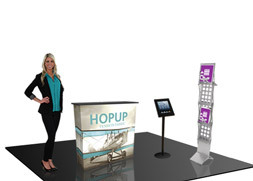 Simply browse our rental displays portfolio to find an exhibit or display solution that will help you achieve your trade show goals. All hardware components will be rented, while all graphic elements will be purchased. Nimlok’s rental display program is a cost-effective and time-effective way to make an impact at your next trade show, convention, conference or event. 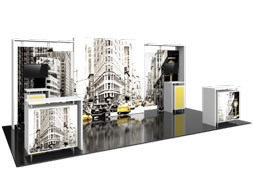 Nimlok’s rental display program offers 100+ off-the-shelf rental display solutions, but Nimlok dealers are also happy to work with you to develop a customized rental exhibit or hybrid-rental exhibit solution. 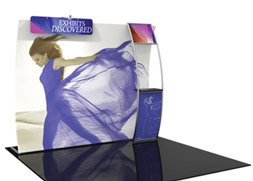 Learn more about our custom exhibit rental options or contact an expert Nimlok distributor to discuss your needs.